Vietnam Fortress Tools JSC (Fortress) was established in 2006 and is the world's leading manufacturer of gardening tools with over 90% of our products exported to the North American and European markets. 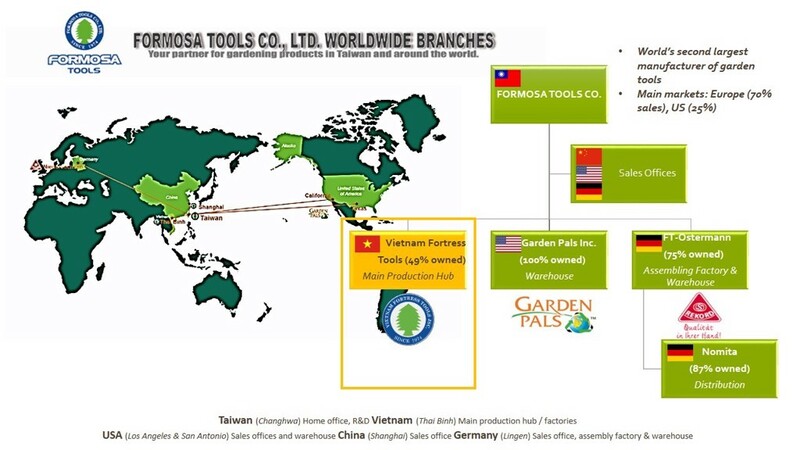 Fortress is a member of Formosa Tools Co., a Taiwanese company founded in 1974 by the Hsu family. 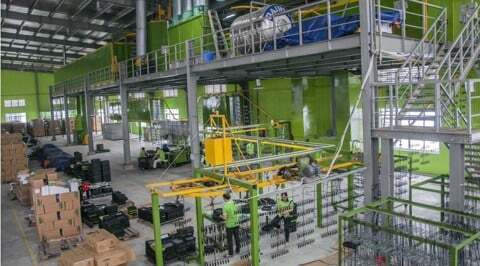 Fortress currently has two factories located in Thai Binh province (north of Vietnam) that serve as the main production hub for Formosa Tools. Fortress Tools JSC is a leading customer-oriented manufacturer of garden tools and consumer products based in Northern Vietnam. We provide great value for our customers by delivering a range of innovative and quality products at competitive costs. 2006: Vietnam Formosa Tools was established in Vietnam as a 100% FDI Company with an original charter capital of USD 0.9 million. It is headquartered at Lot B8+B9+B10, Phuc Khanh Industrial Park, Thai Binh City, Thai Binh Province, Vietnam. The company began construction of a factory to manufacture hand tools and outdoor furniture for a total investment of USD 3 million. 2007: The Company increased its charter capital to USD 1.8 million and also increased investment in the first factory to USD 6 million. The first factory was completed with a total area of 5.2ha and a maximum capacity of 2000 tonnes per year. Products are exported to Formosa Tools’ customers around the world. 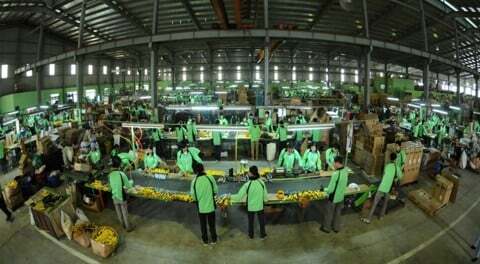 2008: The Thai Binh factory became Formosa Tools’ main production hub when production at its Fuzhou factory stopped. 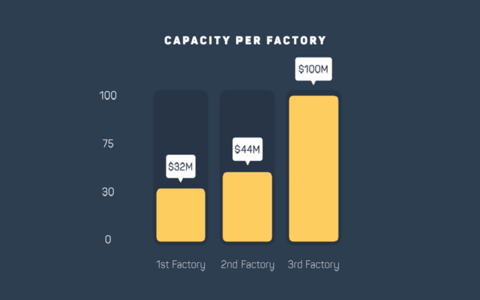 2009-2015: The Company continuously expanded in terms of capital and production capacity with total investment for the factory increasing to USD 10 million. 2016: The Company converted from a limited liability company to a joint stock company. 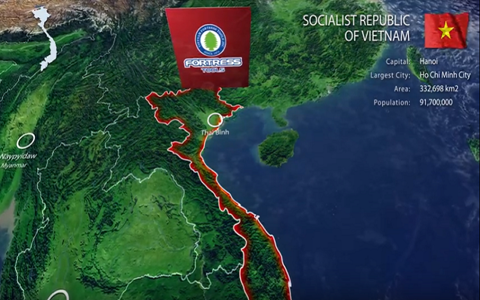 It then changed to the current name – Vietnam Fortress Tools JSC in order to distinguish itself from the Formosa Steel Ha Tinh Corporation which belongs to the Formosa Plastic Group in Taiwan. 2017: The Company continuously expanded in terms of capital and production capacity, and invested in the 2nd factory with total investment of USD 6.5 million. The company also set up plan to build the 3rd factory in 2018. Hsu Ting Hsin (Tony Hsu), Taiwanese national, is the CEO and Chairman of the Board of Vietnam Fortress Tools JSC as well as Chairman of the Board of Directors and General Manager of Formosa Tools (Taiwan); President of Emblem Holdings Group Corp., the two largest shareholders of Vietnam Fortress Tools that are related to Formosa Tools (Taiwan). He is experienced in garden tools manufacturing and is the third generation of the Hsu family who founded Formosa Tools (Taiwan). He graduated from the National University of Business majoring in Tax and Law, and also from DeVry – California College in Marketing. 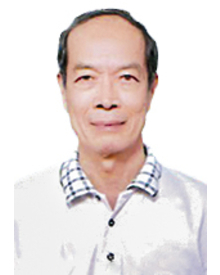 Liang Tung Hsing (Raymond Liang), Taiwanese national, is a member of the Board of Directors of Vietnam Fortress Tools. He has nearly 30 years of experience in accounting and finance. He is also the Deputy General Director of Formosa Tools (Taiwan). 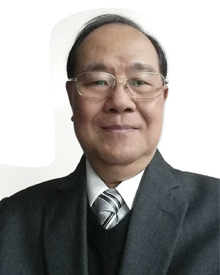 Tsai Jer Shyong, Taiwanese national, is an independent member of the Board of Directors of Vietnam Fortress Tools. He is an experienced finance and banking expert and has held important positions at many Taiwanese banks such as: CEO of First Bank, CEO of First Holding, Chairman of the Board of Directors of Land Bank of Taiwan, Chairman of the Board of Directors of Bank of Taiwan. 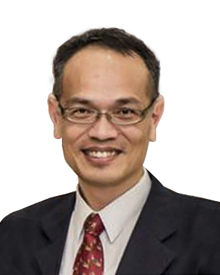 Tsai Chui Tien, Taiwanese national, is a member of the Board of Directors at Vietnam Fortress Tools. He is also the Chairman of the Board of Directors and CEO of Khai Phat Dai Tin Co., Ltd. (former name: Dai Tin Industrial Zone Development Company) which developed the Phuc Khanh Industrial Zone in Thai Binh city. Carl Ronald Gordon, a British national, joined Fortress Tools Vietnam’s Board of Directors as an independent member in December 2017. 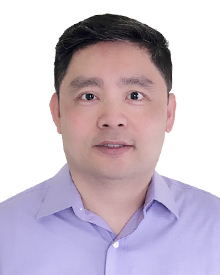 He is also the Country Head and Director of Khronos Advisory Vietnam, an M&A advisory boutique, based out of Bangkok Thailand and a member firm of the global Mergers Alliance network. Carl started his career with PriceWaterhouse in the UK and during his career of more than 25 years has held a range of senior management positions in the Big4 accounting firms and leading financial institutions in the Middle East, Singapore and Vietnam, including leading KPMG Vietnam’s corporate finance team (from 2009 to 2013). He is an expert in financial accounting, auditing and corporate finance. Carl graduated from the University of Manchester, UK and is a Fellow member of the Institute of Chartered Accountants of England & Wales (ICAEW). Keep costs low to pass savings onto customers. Be reliable and deliver products at high standards. Set ambitious goals and expand product range to better serve customers. Having lean management leads to fast, impactful decisions. Accept personal responsibility to meet growing needs of the business and customers and be accountable for our conduct. Do not be complacent, challenge the status quo, and find ways to improve. The Company currently has two factories with an estimated capacity of 60 million garden tools per year. It is planning on building a third factory in 2018 to meet the increasing customer demands. All factories are located in Thai Binh province, Vietnam.